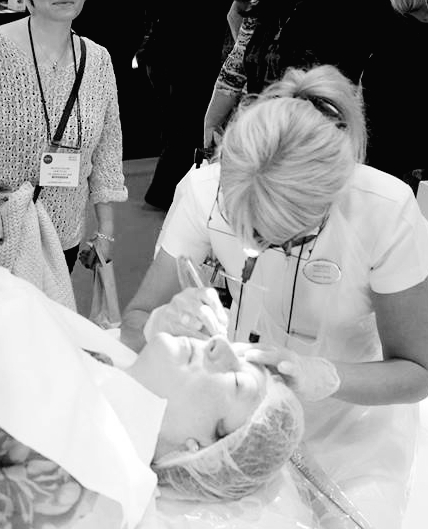 Throughout her career, Karen Betts has always been dedicated and passionate about supporting professionals in the permanent cosmetics industry, and helping to raise industry standards. With this in mind, Karen and her team of Elite Permanent Cosmetics Artists are returning to Professional Beauty North on 20 – 21st September 2015, in Manchester central, to educate professionals within the industry and carry out permanent cosmetic treatments. Karen will also be running a seminar to inform and inspire professionals and people interested in the beauty industry on ‘How permanent cosmetics and medical tattooing can boost your business.’ Through this seminar Karen will be imparting her business knowledge and expertise in permanent cosmetics (which spans over 20 years), and advise how running a business in this sector of industry has the potential to reap huge financial rewards. The seminar will take place on the 20th September, at 3pm, as part of the ‘Advanced Treatments Programme’, and as one of the Professional Beauty Show affiliates, Karen is able to offer an exclusive discount to anyone wishing to attend her seminar. Delegates can benefit from a 50% discount by entering ‘DISP16’ at checkout. The discount code can also be redeemed on seminars hosted by Karen’s partner companies Nouveau Skin Therapy (Sally Durant hosting ‘Getting into Medical Aesthetics’ seminar) and Nouveau Lashes (Steven Douch hosting ‘Eyelash Extensions – Why offering one treatment is no longer enough’ seminar) which also take place on the Sunday. Whether you’re a professional currently operating in the industry, or someone looking at training or developing a career in permanent cosmetics, Professional Beauty North is the perfect opportunity to meet Karen and her Elite team, and learn from the very best in the industry. Register for tickets here. Located on stand C3, professionals can visit for a friendly chat and gain more information and advice on training opportunities available at Karen’s Permanent Cosmetics Training Academy; Nouveau Contour. Karen will also be giving away a limited number of free 2ml samples from her new K.B Pro pigment range, and the full K.B Pro range will also be available to purchase on the two days Karen exhibits. Delegates also have the exclusive opportunity to book a permanent cosmetics treatment in advance with Karen or one of her Elite Artists by calling 0844 801 6838 or emailing [email protected] Hurry as there are limited spaces left, and normal reserve/waiting lists for treatments by Karen or her Elite Team at one of their clinics can be months.